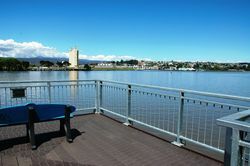 Viewing platform in West Tamar wetlands is dedicated to former Launceston Mayor and long serving City Council Alderman, Graeme Beams. 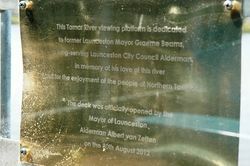 The platform recognises his passionate advocacy of the river's potential. 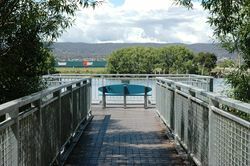 Graeme Beams was directly involved in the development of a number of boardwalks around Launceston's riverbank. Graeme Beams devoted much of his public life to attracting funding to improve his city and its surroundings. He spent 26 years pestering federal and state entities for funding. He secured money for numerous projects including the Earl Art Centre, the Summerdale Community Centre, the St Leonards Hockey Centre, the Inveresk Railyards development and the Launceston bikeway.